It's interesting that a band of such calibre is able to push a record like this, without caring about what various broadcasters will say, and their record label. This album, hurtled from the band being considered by them as an "experiment", is really a following of one's self stylistic genre in metal. This album, is another branch of metallic science. Such mechanic-ism throughout this album is achieved, and not for one moment are the pistons ever slowing. The highlight of the album considered "In Death - Is Life" and "In Death - Is Death" is Meshuggah portrayed in sixteenth gear. Sublime. 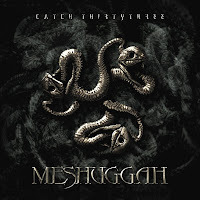 And, let's never doubt that at the beginning of the record we are slumped with a slow repetitive dull rhythmic riff full of tedium, but rather we are introduced into this mechanic hypnotic maze that's only presented by the apparatus of what Meshuggah is. With the rusted spasm of each riff, and the device of Haake's 4x4 symbol 'hiss' we really have an engine gone wrong; or working 'nihilistically'. As we hear Sum, we are presented by what can only be described best as a mirage of sound - this machine functions.. not. The albums eerie feel is unmissable. With such poised potency rhythmically, and the force which beckons Kidman's vocal work, will be remembered for generations to come. No one can and ever will, do this again - 5/5.